Press the (display) button to change the display. Select to go to the home screen. 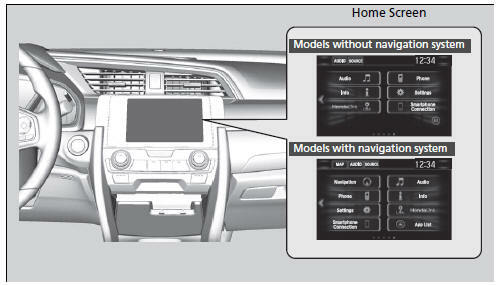 Select Phone, Info, Audio, Settings, Navigation*, HondaLink, Smartphone Connection (Apple CarPlay, Android Auto), App List, or Instrument Panel. Use simple gestures - including touching, swiping and scrolling - to operate certain audio functions. Wearing gloves may limit or prevent touchscreen response. Displays Trip Computer or Clock/Wallpaper. Select on the Info Menu screen to see all available options: Trip Computer, Voice Info, Clock/Wallpaper and System/Device Information. Current Drive tab: Displays the current trip information. History of Trip A tab: Displays information for the three previous drives. The information is stored every time you reset Trip A. To delete the history manually, select Delete History on the History of Trip A tab. The confirmation message appears on the screen, then select Yes. Voice Info: Displays the all commands list. Clock/Wallpaper: Displays the clock and wallpaper. System Info: Displays the software version of the audio system. USB Info: Displays the memory usage of the USB device. Displays the current audio information. Enters the customizing menu screen. Connects with your smartphone*1 to play personalized music, information, and social media streams. Connects with your smartphone*1 and allows some apps on your smartphone to be used on the audio system. Adds or removes apps or widgets on the home screen. Selects from three customizable settings for the driver information interface.